Bannock seems to have originated in Scotland, but it became very popular in the wilds of Canada and the American West. It is easy to make and does not even require a pan to cook it. Kids would enjoy learning how to make Bannock bread, as it can be cooked directly on the hot coals. I cheated a bit and made mine in the kitchen on the stove. It is an easy way to have hot fresh bread in under thirty minutes. You’ll need the following ingredients. 2 cups of flour (white or wheat) I used one of each. 1 tablespoon of baking powder, I used one without aluminum in it. Enough water to mix into stiff dough. Throw the ingredients into a bowl and mix; you want the dough stiff enough to stick together. The dough was formed into a large patty between 1 and 2 inches thick. I then threw it in a cast iron frying pan that I had heated some oil in. The dough cooked on one side until I could flip it like a pancake. The backside was then cooked until I could stick a fork in it and it came out clean. The bread was hot, fresh and delicious. 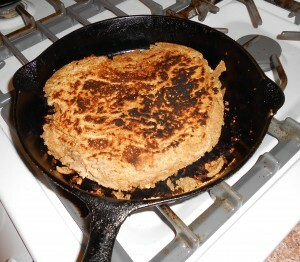 The bannock may have a few burned spots on the exterior by the time it is cooked, but it will be good on the interior. Now the same recipe can be used outdoors without a pan. Just lay your bread patty directly on the hot coals. When the bottom is done, flip it. When the bread is finished brush the ashes off and enjoy. The finished bannock ready to come out of pan. You can make variations of this bread by adding raisins or other dried fruits. Bannock bread cooks fast and requires less fuel than other forms. 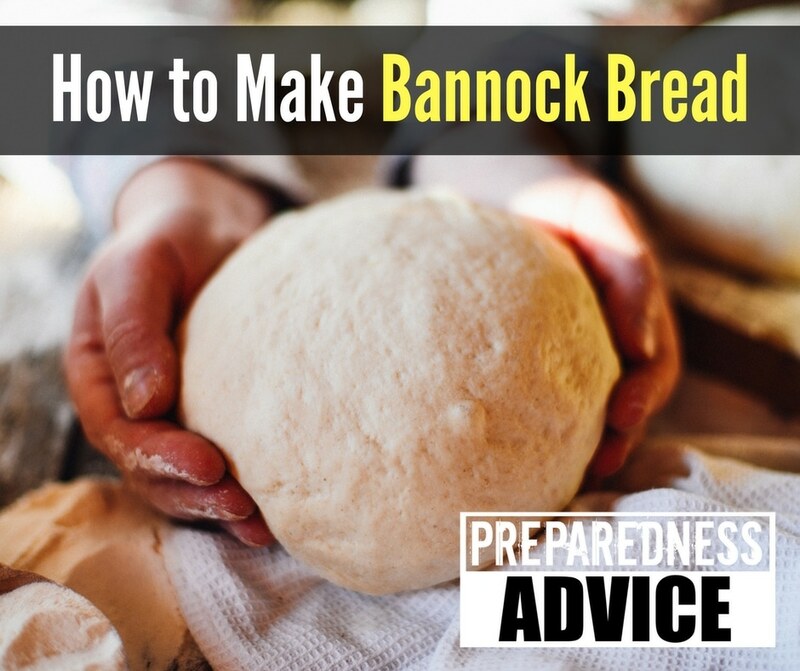 The pioneers knew how to cook Bannock bread and now you do, too! Enjoy! The Survivor Rocket Stove is the Greatest. 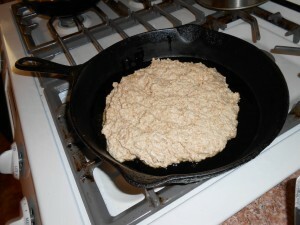 This entry was posted in cooking, recipes and tagged bannock, bread, bread recipes, recipes. Bookmark the permalink. I spent some time in Canada with the local Black Foot. They make bannock a little different. First no sugar is used and it is baked in the oven at 350 d. until it starts to look brown at the edges. ( I put a toothpick in it.) I have never seen it turned over, but I have seed it cooked over a camp fire on an old cast iron plate. You will also need lots of butter and do not expect it last long. I’ve read a lot of recepies for bannock and they all include sugar. I wonder if anyone has tried brown sugar, honey or artificial sugar instead of sugar. Any ideas on this? I think any of them would work, next time I will try it. But don’t like the artificial sugar. cook it in a pan with lots of oil that’s it. And we reuse the same oil again and again. If you make dessert then you put sugar. The part about minimal use of fuel and time is extremely important during a disaster event when both will probably be in short supply. Gonna give this one a try. Thanks! Great site with lots of great info too! I too enjoy Bannock…just a little different recipe, I add a bit of baking soda, less salt, less sugar and less flour (empty nesters). One of the things I’ve learned is that it’s LOW and SLOW or you will burn the bread sides. Also, using a fork and NOT overworking my dough makes my bread very tender. We enjoy eating ours as a side with breakfast meat and eggs. Also butter the top, and then use whatever suits our fancy…jelly, jam, powdered sugar, sugar w/cinnamon, syrup, or honey or ??? I did historical re-enactment for years as a Scot and there was a woman in our camp that made the best bannocks ever. She used oatmeal (Quick Oats), a pinch of salt & hot water. There wasn’the really any measurements. I watch her make them many times. She would break off a bit of dough, flatten it out fairly thin and toast flat on a hot griddle until it was golden brown and delicious. They were great with a bit of butter & maybe some honey. Brad Angier in several books gives a bannock recipe that uses no sugar and cooks the bannock in a cast iron skilletpropped on a rock facing the cookfire as a reflector/heat trap.also no oil. Hi, my mom is 97 an she makes this like making biskets. Milk, grease, flour. Fry in pan bacon grease or regular oil . She calls it ho cake shes from georgia. 71 an still make it for my son an i.